With crisp temperature the morning was ripe for coffee outside. The agenda: ride to the Campbell Recreation area for a breakfast brew up. My route there included the Waukee-Clive portion of the Raccoon River Valley Trail. I dislike this trail segment...very much. It includes crossing numerous intersections, entryways, and riding alongside four noisy lanes of traffic. One can not/should not ride here without being "on alert". Using a different route, the ride back was enjoyable. The pretty greenbelt, quiet neighborhoods and easier intersections are my preferred way to pedal between Waukee and Clive. It's definitely one less traveled. 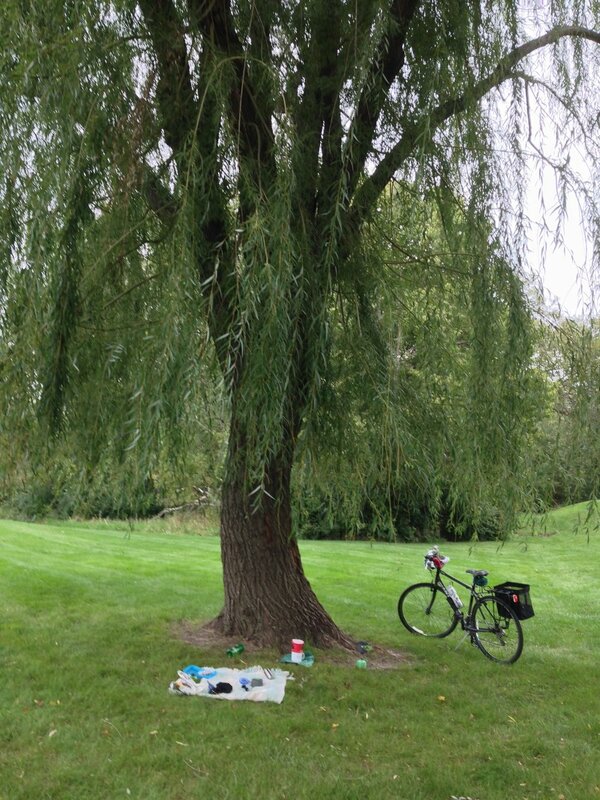 Sure, there are plenty of picnic tables at the park, and yes it was a cloudy day, but I couldn't resist setting up my little breakfast camp underneath a beautiful Weeping Willow. I recently acquired two new additions to my kit. 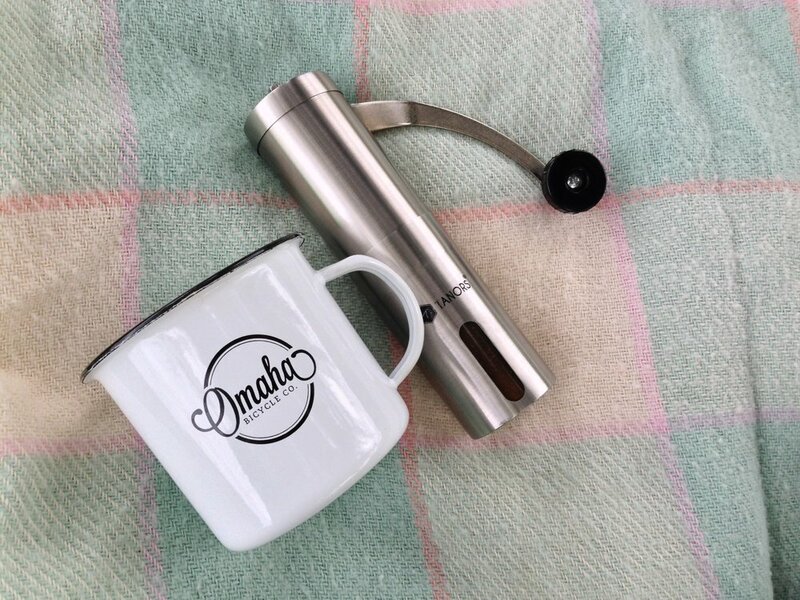 A camp mug from Omaha Bicycle Co and a burr grinder by Tanors. Turns out grinding beans is a fun way to kill time while the water heats. My pouring was a bit sloppy but the results proved positive. Cross your fingers temperatures stay conducive for morning activities like these. *Jam Jar beans from Kickapoo Coffee Roasters. Was This Even A Bike Ride? With three parks along the Clive Greenbelt, it's a popular spot for young families and employees escaping the office for a bit of outdoors. On this ride I saw mom's with kids, a group of preschoolers out on a field trip, picnickers, and walkers. It's a busy trail so riding slower does everyone a favor. The western portion of the trail awaits reconstruction and remains with it's bumps, dips and twists and turns. No word (yet) on what 2016 has in store for construction or possible closures. No coffee outside and no snacks? Was it even a bike ride? Without a bike break it certainly felt like something was missing. Gasp! Is this what it feels like to be training for something? Trust me, this ride certainly can not be placed in the category of training. It can however, can be filed under interesting. 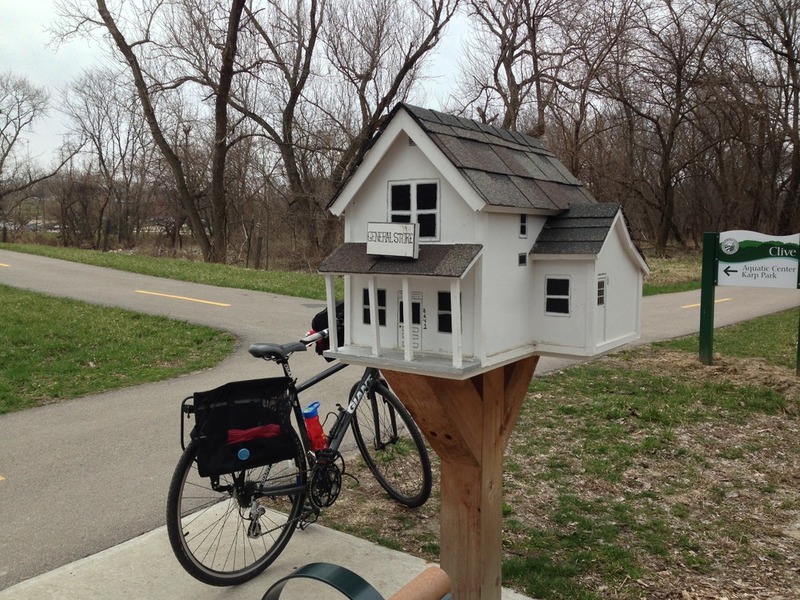 I pedaled by things you'd never think to see along a bike trail. 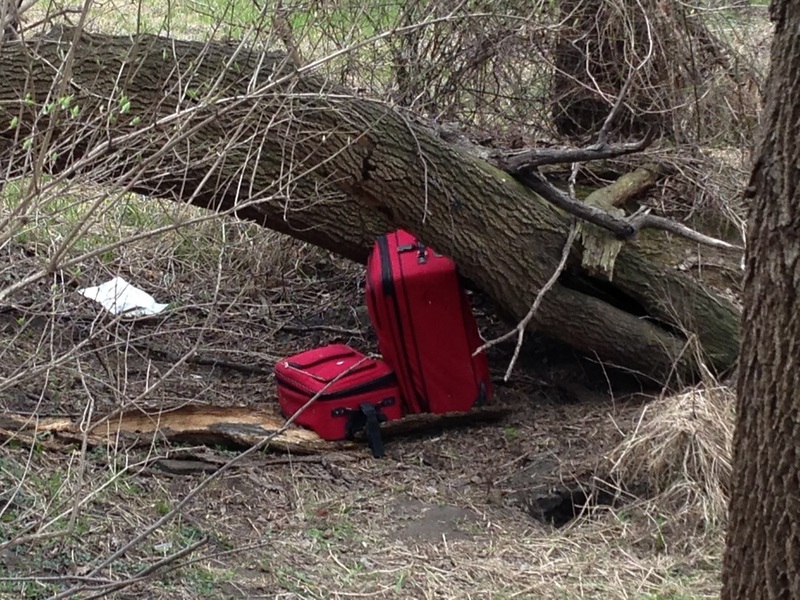 Things you'd never think to see along a bike trail. 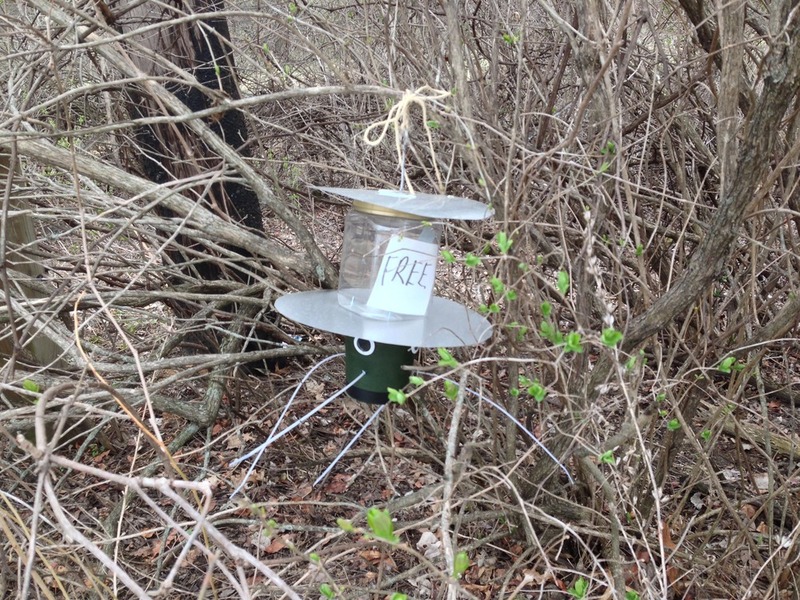 Bright red luggage stowed among fallen trees, a bird feeder labeled "free" crammed into a bit of shrubbery and Christopher 'Walkin'. 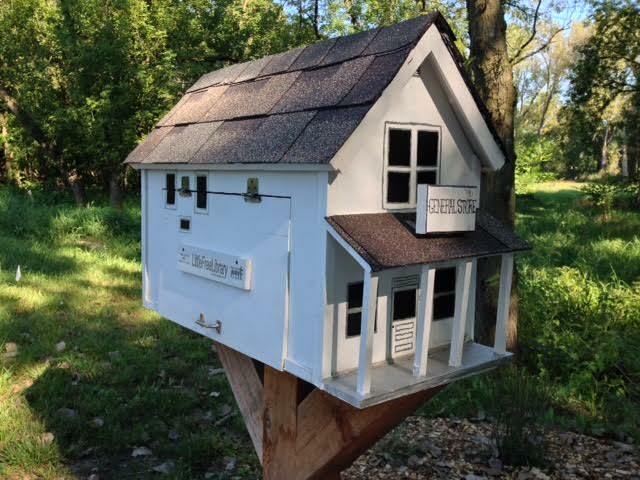 The best sightings were two additional Little Free Libraries. My favorite one was the barn theme in Colby Park created to remember the father of Windsor Heights' mayor. All had books inside waiting to be borrowed. 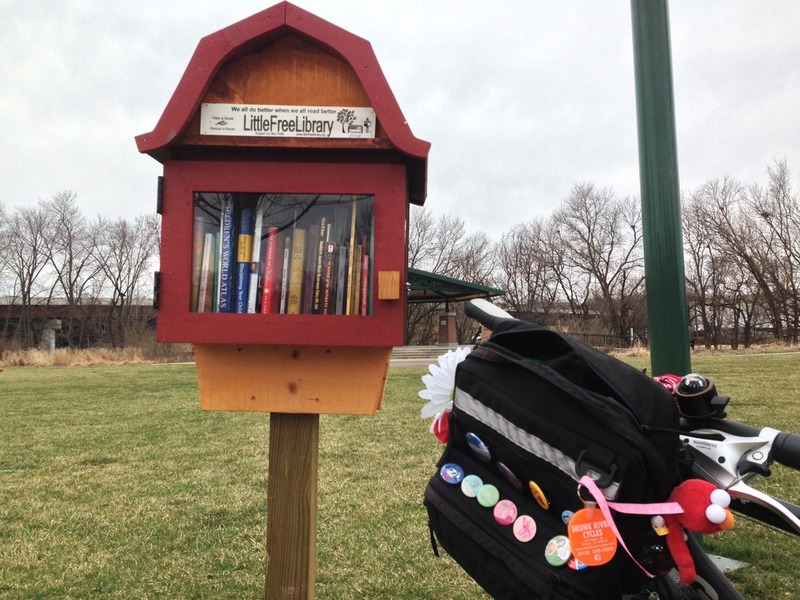 Next time I ride the the Clive Greenbelt I'll bring along books along to donate. This ride was a great reminder that they all don't have to include food. But I'll admit, the best rides rides always do! After days of gray the sun finally showed itself. To celebrate I took a midday meander along the Clive Greenbelt. 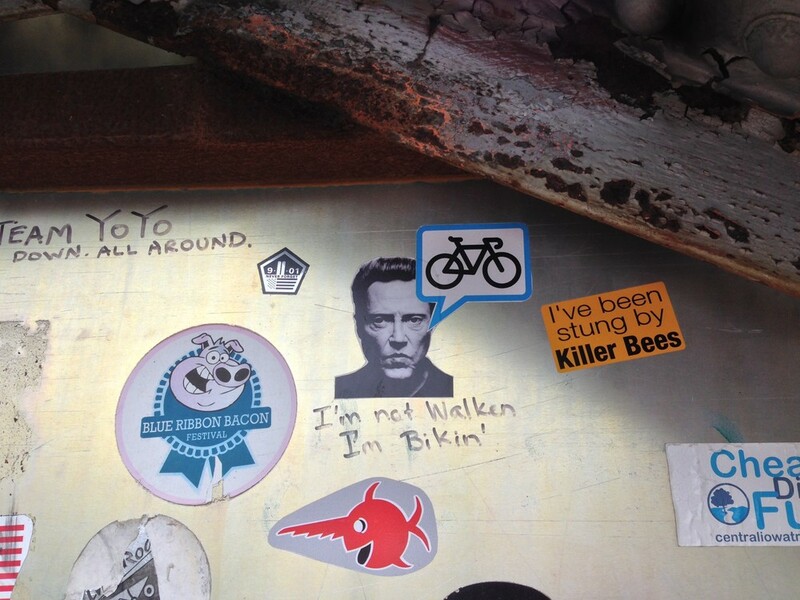 I left my baggage behind and rode off on a borrowed bike. It always feels strange riding without the accouterments. No handlebar bag, no bell, no bottle cage. Bare bones indeed! The trail was quiet, which was good. It made it easier to dodge puddles and slippery spots. I think I enjoy this trail best when there are no leaves on the trees. It makes it easier to see who might be coming around the next bend. The highlight of the ride was spotting an unidentified owl species. I'll have to check my bird book to see if it's native to Iowa. Considered a critical trail within the Des Moines metro area, the Clive Greenbelt has been undergoing significant transformations over the past two years. 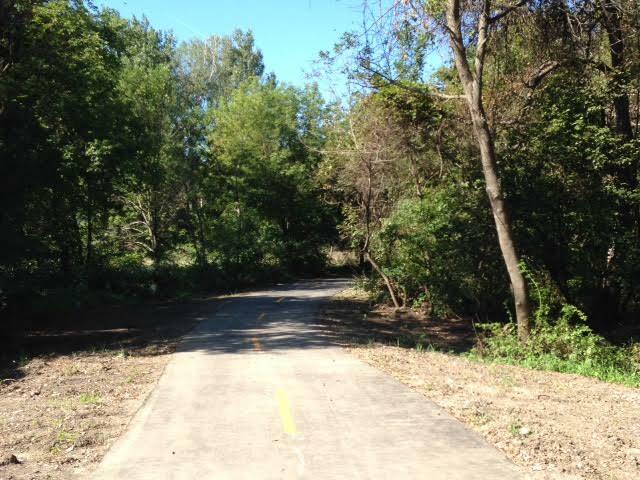 This summer, improvements were made to western portions of the trail and within Campbell Park. Enhancements will continue over the next three years and will include connections to neighborhoods, flood control for Walnut Creek, trail signage, replacement of trail surfacing and the opening of trailside businesses. Having heard the trail had re-opened it was time to check out the new construction. I also wanted to contribute to the Clive Greenbelt Rehabilitation fund by purchasing a trail t-shirt. It would be a fun addition to my ever growing collection of biking shirts. Making my way over to City Hall I enjoyed the new wider and much smoother surface. The entrance to Campbell Park looked great! 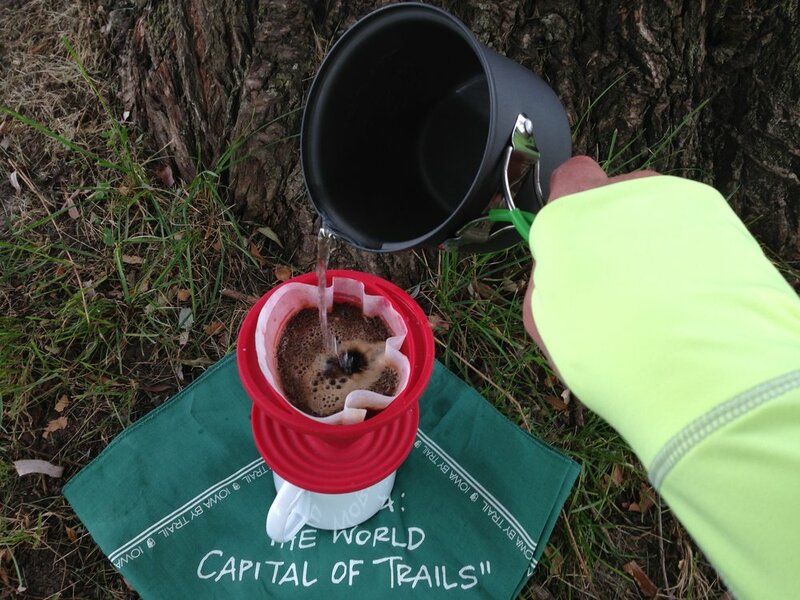 It's now much easier for users to get on/off the trail. 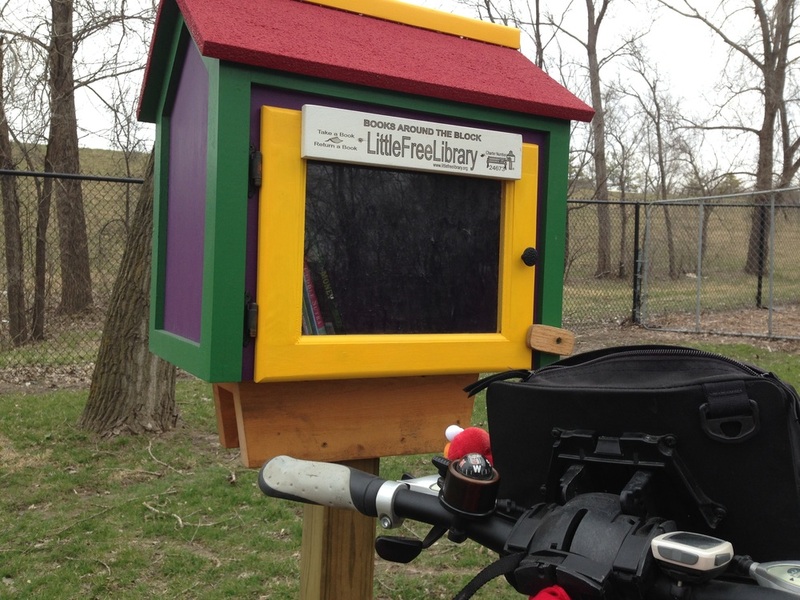 Also spotted were new benches and also a extremely cute Little Free Library. Art Along the Trail was still on display. I stopped to check out "Fowl Play" installed along 114th street. 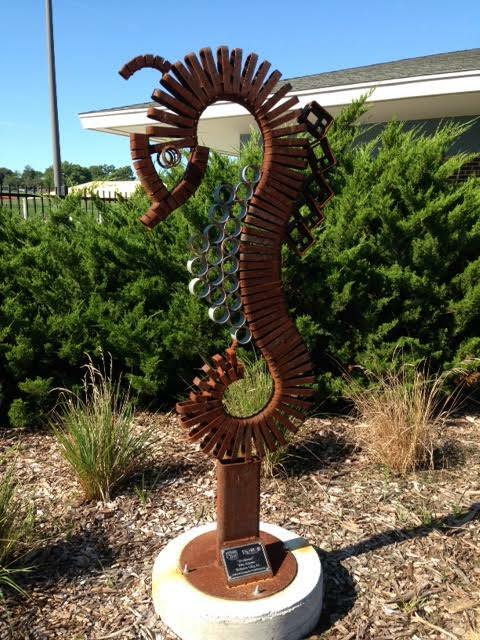 It was created by Tim Adams, who also had "Seahorse" displayed last year, It is now located just off the trail at the aquatic center. At City Hall I was informed t-shirt sales were going well with an average of ten sold a day. Not too shabby! I also learned about the Open House scheduled for Sept 17th from 4:30 - 6:30. Trail users will have an opportunity to provide input on the trail project, along with partaking in food and fun. Oftentimes change can be challenging to accept or seen as a negative. But along the Clive Greenbelt, change is for the better. It will be exciting to see it continue to evolve over the years. 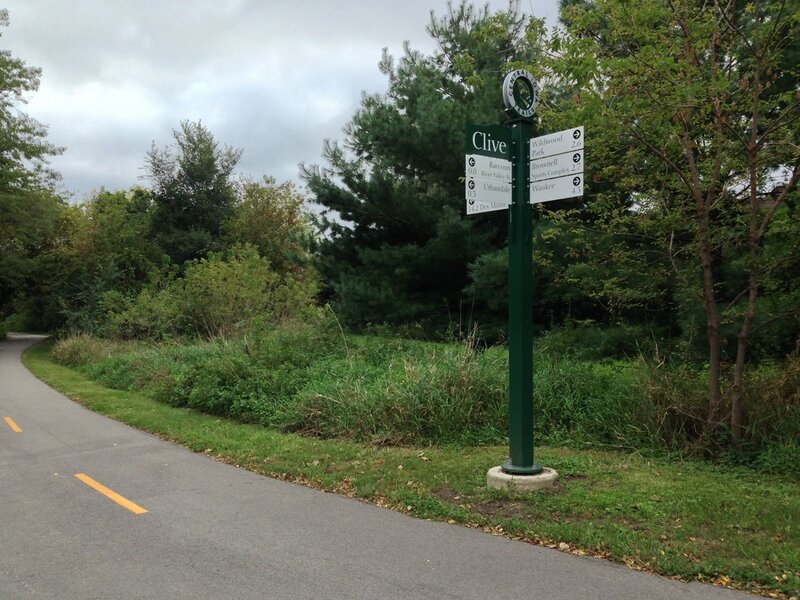 Located on the western outskirts of the Des Moines metro, The Clive Greenbelt is an asphalt urban trail that runs for eleven miles through the heart of Clive. 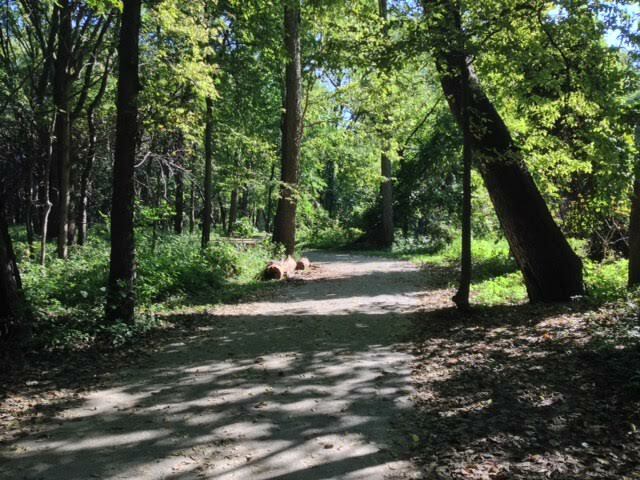 It winds through the Greenbelt Park Forest and Woodlands, past Greenbelt Prairie, and several city parks. 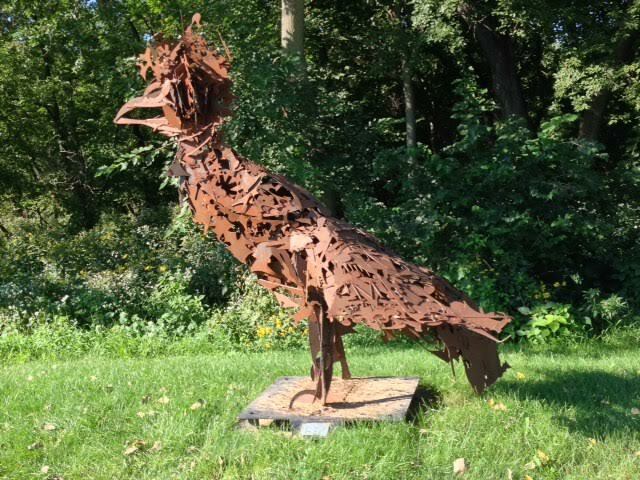 The Clive Greenbelt is also known for it’s yearly sculpture exhibit, Art Along the Trail. Mimicking the twists and turns of Walnut Creek the Clive Greenbelt is a fun trail to ride. It can get quite busy resulting in the need to slow down and stay observant of others enjoying the trail. Bumps and dips caused by tree roots are another reason for being on alert. However, overly cautious riding may soon be a thing of the past due to trail improvements. Between NW100th and 86st the trail has changed significantly. New asphalt is smooth as glass and the removal of curves takes away the surprise of finding pedestrians around the tight bends. Despite the removal of several switchbacks, there are still plenty to lean in and out of west of NW 100th. It will be interesting to see what additional changes will take place on the trail over the next year. Like most rides, I took my time and even ventured down trail spurs to see what I could find. Most had interesting views of the creek and bridges to cross. The white mottled branches of a sycamore tree caught my eye. A favorite, these grand trees beautifully stand out against the browns of winter. The 1-80 bridge had quite the fresco spray painted on one of it’s supports. I wonder how long it took the artist to complete, what it means, and if it too will have changed the next time I ride by.